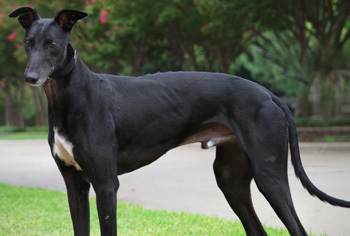 Max, aka Wild Snyds Ride, is one of 9 greyhounds GALT received from a Fort Worth Animal Control cruelty case. See his story here. After extensive treatment closely monitored by Dr. Christy Soileau of VCA Preston Park Animal Hospital, Max tested PCR (polymerase chain reaction) negative for all tick-borne diseases. He also tested heartworm negative at this time. 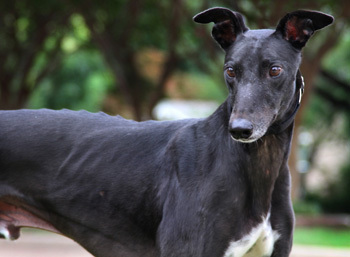 As a result he has completed all of his medical procedures and is ready to find his forever home! 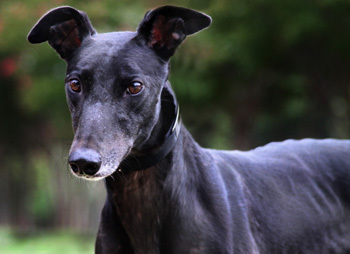 Max is a 3-year-old black male born May 30, 2007. His sire is Flying Penske, and his dam is Kay Cari Pennys. There are no races to his credit on Greyhound-Data.com. Max is not cat tolerant and has not yet been tested with small animals. This quote from Dug the dog in the movie Up sums up Max's attitude perfectly: "I have just met you...and I love you!" It's easy to fall for Max just as quickly as he falls for you. He's just a wonderful boy who loves people. He's affectionate but not needy. He's confident but not pushy. He loves his meals and his walks. He isn't destructive, and is happy being crated or being left loose. He will give you sweet kisses and gentle ear nibbles. Max's house manners are excellent. Right before a walk is when Max at his most enthusiastic - he tends to paw at the door in excitement so we're working on a good 'wait' command. Max is a quick study - he know commands like 'crate' and 'down'. In fact, he's so eager to obey the 'crate' command that sometimes he'll squeeze into an already occupied crate or pen! He has not learned how to play with toys yet, but he would like to chase some kitties - no cats for Max. He gets along very well with other dogs. He's not bothered by storms, and rides in the car well. Come meet this gorgeous guy, and you'll be hooked!